Submitted by mahoney on Tue, 11/04/2014 - 5:50pm. 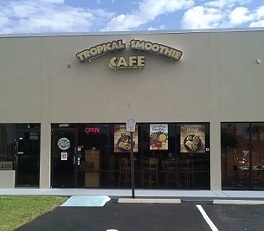 Tropical Smoothie opened its first restaurant in Tallahassee, FL in 1997 and by 1999 added a wide range of wholesome food options to their menu. Today, Tropical Smoothie Cafe has a menu that boasts bold, flavorful food and smoothies with a healthy appeal. All items are made to order using the freshest ingredients, using real fruit and veggies. Their toasted wrap, sandwiches, flatbreads and gourmet salads are made with high quality meats and cheeses, topped with fresh produce and flavorful sauces. Updated the file. Net increase of 112 locations. Updated the file. Net increase of 40 locations. Updated the file. Net increase of 71 locations. updated the file. Increase of 42 locations.